Yesterday, Sequel Group asked our employees to bake a whole host of yummy baked treats for our own Bake Off competition to raise money for Cancer Research UK. With our very own Mary Berry and Paul Hollywood (better known internally as Emily Atkins, one of our Designers, and Charles Fenoughty, our Digital Director) judging the cakes we had a great mix (no pun intended) of baked goods – from gooey chocolate brownies to a multi-layered pink cake with smarties hidden inside (baked by our runner up, Debs Mansfield). 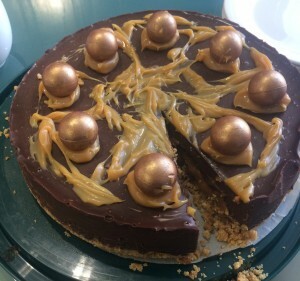 The winner was our Studio Manager Steve Sims with a very topical spooky salted caramel and chocolate torte that won over not only the judges but everyone who tried it. Best of all, we raised £120 for Cancer Research UK.